I’m sure you’re probably already thinking, ‘What? What on earth is she talking about?’ But bear with me, it will be so worth it! Honestly, this is the coolest thing you’ll read all day. Okay, so you know how traditionally speaking most things that happen during a ceremony have a special person who is chosen, or whom tradition chooses to do the given task. Dads walk daughters down the aisle, flower girls sprinkle petals on the ground, friends or family members do readings, best men spend all day bricking themselves about their speech, but hold it together enough to deliver the rings (just!). So you get the idea, certain roles are played by certain people, loved ones who have usually been chosen by the couple (sometimes painstakingly so) to do the role that they’ve been given. Two of the most prominent roles of a wedding ceremony, the ring bearer and the witnesses, can also make for the two of most difficult decisions when it comes to deciding on who will do them. But what if couples rid themselves of the burden of choosing (if it is a burden) or have some fun with the process by letting fate decide who these special roles will be given to? Now, is this exciting? Or exciting? Let’s take a look at ring bearers first of all, a role usually given to small, unpredictable but very cute children, or grown up, overly-preoccupied men. If you want to shake things up a bit and do things differently, then making a lottery out of it will certainly do that. So how does it work? When it comes to selecting a ring bearer, what some awesome couples have done is to tape the rings under a seat in their ceremony area. 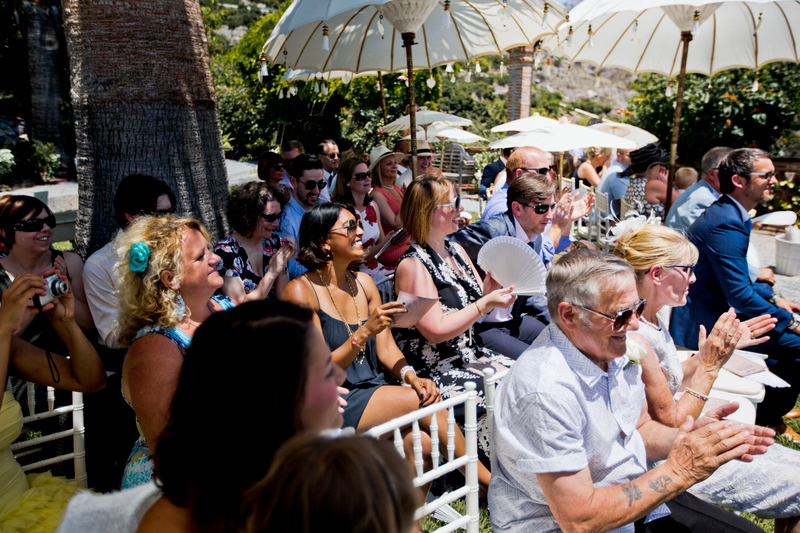 Guests take their seats and at some point during the ceremony, everyone is directed to feel under their seat to find out who the lucky ring bearer will be. Whoever it is makes their way forward to hand over the rings, or do whatever it is that they’re instructed to do. Imagine the joy, excitement and surprise in finding out who will bring your rings forward to you, and also for the person who finds out that it’s them. Oh my word, how much do I love this? Yep, that much. Thank you to whoever thought of doing this, because it’s awesome. I only know about it because some of my Celebrant colleagues have discussed doing it with their fabulous couples! Amazing! Major hints to any of my own couples reading this, ha! Okay, so let’s throw in some caveats here, because you know I always get way too excited and I need to pull back and calm myself down with some common sense advice. Most wedding rings are quite expensive, or if not in financial worth, in sentimental value. So, it’s probably not best to do this in an area that’s very public, and not private to you and your wedding guests. Nor in an area where if the rings were to separate themselves from the chair, you’d never ever see them again. You will want to put the rings in an envelope or a cloth bag, and tape them well to a chair. It’s a really good idea to put someone in charge of doing this, your Celebrant possibly, or your best man, wedding planner or a trusted person. My advice would be to place the rings under the chosen chair just a few minutes before guests are asked to take their seats. In the same way that the rings never leave anyone’s possession in a normal case of ring delivery, neither should they leave anyone’s sight once placed under the chair. Not because they would be stolen, but simply to make sure that they stay in place until everyone is seated. To really ramp up the surprise, I would suggest that guests are only told to feel under their seats moments before the ring exchange. If it’s mentioned too early, people will be too excited (I would be) and too distracted (yep, me again) wondering if they’re the chosen one and so not paying attention to the rest of the ceremony. Tape the rings well, but don’t go crazy, so that the poor chosen one is having to break a nail, or worst still, has to get off the chair, and turn it over to remove the rings. You want this transaction to be a smooth one. Therefore, the idea is that a) the person should be able to feel the envelope or bag, simply by reaching their hand underneath the edge of the seat and b) should be able to remove the ring pouch with a gentle tug. Other things to bear in mind include having a think about the make-up of your guests and how they’ll all be seated. Maybe you want to avoid the front two rows if you have elderly family members with mobility issues, for example. This is where the help of a wedding planner or best person comes in handy, as they can help to people-manage the space and make sure only appropriate people sit in the special spot. Now if that doesn’t tickle your fancy enough, maybe you might want to go really crazy and separate the rings so that you have two ring bearers. Whoop, now we’re talking. This means twice the amount of excitement and twice the amount of planning and vigilance, but definitely do-able. There are lots of variations to this ring-bearer lottery as you can imagine. Those who aren’t comfortable with having their rings anywhere but in a box being held (firmly) in someone’s hand, might prefer to actually invoke a true lottery element. So instead of taping rings to the seat, a number is taped to the seat, placed in the order of service program, written on to a paddle fan (think Strictly Come Dancing judges), or simply handed to people as they take their seats. Then during the ceremony the couple pick a number from a bag and the person with that number can collect the rings from the best man or best person/bodyguard/VIP and then take them forward to the couple. There are lots of ways that this can be done and all fun! There is nothing like making your wedding guests feel involved in your ceremony to create an extra special vibe of love and togetherness. And this leads on to the witness selection process, which pretty much follows the same guidelines. People can have numbers taped to their seats or you can think of some really creative ways to create the lottery part of it to select who your ceremony witnesses will be. One little word of advice, if you’re having a legal ceremony check that this is even possible. In some countries, areas, witness information needs to be given in advance. Maybe there are certain pre-requisites to being a witness, which might make a witness lottery impossible. So do check! But if you’re good to go, then go for it! In both cases, the ring bearing or signature signing, I can’t think of a nicer way to include your guests in your ceremony and to add some fun and excitement, as well as trashing tradition a little and shaking things up. So what do you think? Has this post got you loving these elements as much as I do? I hope so! Leave a comment and let me know below.